Frank Sinatra Fell In Love With Me…in my dreams! 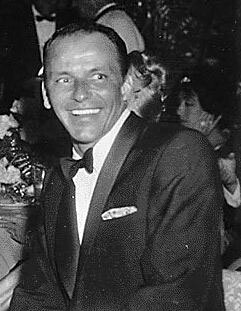 Last night I had a dream in which Frank Sinatra was pursuing me…romantically. In my dream I was my current age…let’s just say “middle-aged.” Ol’ Blue Eyes was looking not too young and not too old, and he was lookin’ good. Somewhere along the line we kissed. He was a good kisser. I think the dream was spawned by an article I’d read about him the day before, an interesting article that someone had posted on Facebook. In the dream I expressed to Mr. Sinatra that I was concerned that his interest in me was grounded in his desire for a one night stand. I told him that wasn’t my style. With a big display of being insulted by the insinuation, he left me and went to the airport to go back to Hollywood. I was sad and regretful. But, lo, he returned a few hours later, having missed his flight on purpose so that he could return to me. He insisted that he’d prove his sincerity. So, he took me back in time to my childhood home. (Remember, this is a dream, where incredulous is the norm.) He said that in order to convince me that his interest was real, he wanted to know all about me. Hence the trip back in time. For days we observed the world of my youth. We stood in the midst of my childhood life and laughed genuinely and felt that sense of endearment that childhood memories can conjure – where innocence and sweetness reign. And he fell deeper in love with me and I with him for his appreciation of those who I have loved. Then I woke up, reality hitting me like an Arctic blast. Through the morning as I mulled over what the dream might mean, I remembered a poem I wrote during the summer. I think Ol’ Blue Eyes was standing in for a brown eyed guy.